In 2011/2012, in UK workplaces, 173 workers were killed and over 27,000 were seriously injured. Some 1.3 million people suffered from an illness they believed was caused or made worse by their current or past work and 28.5 million working days were lost as a result of occupational injury and ill-health. The vast majority of occupational accidents and incidents of ill-health can be avoided by good health and safety management. With this in mind, the British Safety Council offers the Level 3 Certificate in Occupational Safety and Health, a nationally-recognised qualification for people with responsibility for aspects of health and safety in the workplace. 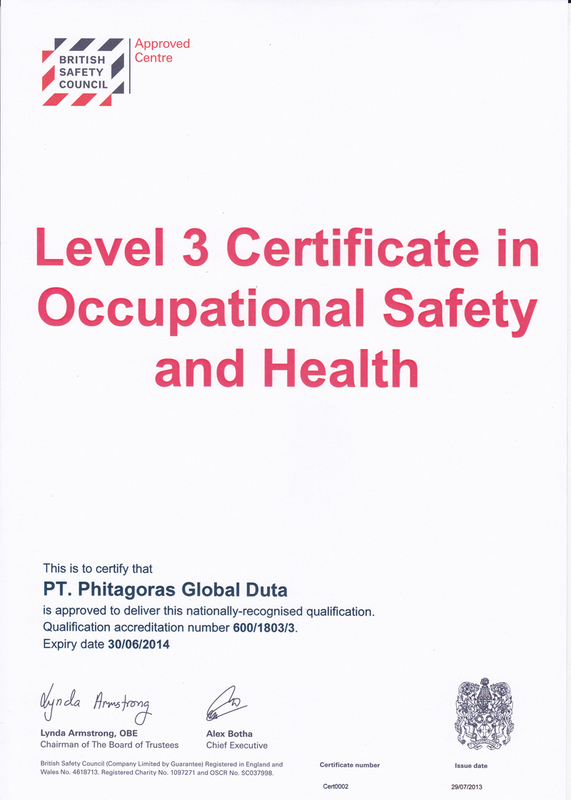 The content of the Level 3 Certificate has been mapped to the National Occupational Standards for Health and Safety and reflects the management model in HSG65 ‘Successful Health and Safety Management’, the Health and Safety Executive’s guide on how organisations should manage health and safety. Organising for health and safety, Developing a positive health and safety culture, Preventing accidents, Occupational health provision, Principles of health and safety law, The Health and Safety Work Act 1974, Offences, penalties and enforcement, Health and safety management, Risk assessment, Persons at particular risk, Safe systems at work, Safe workplace, Personal protective equipment, Fire, Emergency planning, Electrical safety, Work equipment, Occupational transport and driving, Construction and demolition, Working at height, Manual handling, Mechanical handling and lifting operations, Display screen equipment and workstations, Chemical and biological hazards, Reporting and investigating incidents, Protecting the environment. The course has two Units 1 (Principles of Health and Safety Management) and 2 (Controlling Hazard in the Workplace) studied over 10 days – Monday to Friday. The two written examinations will be held on the last Saturday. WHO SHOULD ATTEND BRITISH SAFETY COUNCIL LEVEL 3 CERTIFICATE IN OCCUPATIONAL SAFETY AND HEALTH ? The qualification is assessed in English only. Assessments will be presented in English and candidates must respond in English. Candidates for whom English is a second language are advised that their reading and writing skills should be equivalent to at least Level 6 of the International English Language Testing System (IELTS) Test for Non-Native Speakers of English. Candidates may obtain information on this language testing service from the IELTS website (www.ielts.org). There are no formal entry requirements for the Level 3 Certificate, but candidates should have a level of literacy adequate to cope with the examination. This recommendation is intended to ensure that all candidates who enter for the Level 3 Certificate can undertake the examination with a reasonable expectation of success. The Course also could be delivered in your company premysis.